After promoting a Super Bowl rally for parental equality and court reform in San Francisco, Dr. Leon Koziol left for Hawaii where he was retained to author two books for a mother and father victim of divorce, custody and support court. He is expected to be in Florida next month to continue his work for victimized parents with a goal of making parental equality and family privacy rights a key issue in the presidential elections. The Super Bowl rally was sponsored by an upcoming group of parents in California fed up with abuses in these courts: http://www.YourParentalRights.com. Messages contained on the various protest signs ranged from “Fathers Matter” to “Stop Family Court Corruption,” and they resonated among the fans entering and leaving a packed stadium. It is hoped that momentum will continue to grow for a rally in our nation’s capital this June. Dr. Koziol has helped parents make their ordeals known for reform purposes. His manuscripts have become highly useful for sending crucial messages to politicians and news organizations. After a conference with influential clergy in Manhattan last month, Leon is hoping to draw interest from CBS 60 Minutes and other producers where he was once featured. These books play a major role for convincing policymakers and news makers that parental equality and court reform are the paramount issues of our day. Even if you are not keen to public acclaim, the books he helps publish provide autobiographies for those who wish to “set the record straight” for their children, families and future generations. However it seems that everyone wants to write a book, but only a small percentage ever see a bookstore or book signing event. Stories are a dime a dozen. It takes litigation experience and proven credentials to transform complex ordeals into a marketable publication. Leon has used his experience to publish such books as his 2014 novel, Voyage to Armageddon, available at Barnes and Noble, Amazon and other major bookseller sites. He has authored reports, appellate briefs and argued cases before a federal appeals court in Manhattan and other locations. If you would like a fee quote or to offer a proposal for publication, feel free to contact him at his office at Parenting Rights Institute, (315) 380-3420; leonkoziol@ParentingRightsInstitute.com or direct at (315) 796-4000. Is the American public surrendering self-governance to rampant corruption ? I have lived to experience something I never thought I would: a voter ballot without any choices. It was Election Day at ward 2-3 in New Hartford, New York and all candidates were unopposed. There was not even a proposition for me to ponder. When I ran for state Senate ten years ago, a statistical tie resulted with a retired state Supreme Court justice as my opponent. The polls were active, the debate lively throughout and it was only a primary. City voter turnouts doubled the number this past week. After recounts, the winner in my Senate race convinced me to run for county executive the next year where I garnered nearly 25,000 votes. Again the debate was lively and lines nearly out the door at the same ward 2-3, this time in the general election. On Election Day 2015 I was the only voter at peak time. Eight workers behind two district tables could not hide their disappointment. After questioning my purpose, I announced I was there to honor their commitment to democracy. Profound gratitude followed with one volunteer remarking that I had just made their day. What’s happening here people? The incumbents may have you believe that they are performing so well that opponents are not needed. Adolph Hitler thought the same, but humans by definition are imperfect. Contested races bring out issues needed for democracy to function properly. Could it be that corruption in government is so rampant these days that the people are simply surrendering to it? 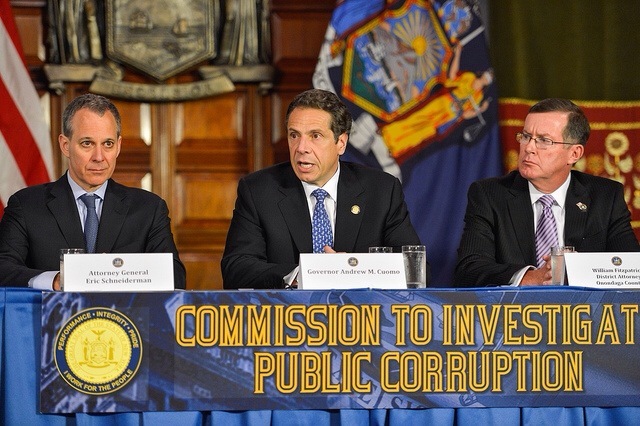 I testified at the 2013 hearings of the Moreland Commission on Public Corruption. The complaints were so numerous that the vast majority were locked outside Pace University. As we know when top state leaders were implicated in those proceedings, the Commission was prematurely disbanded. Fortunately an angry federal prosecutor who also testified at that hearing seized the files resulting in the indictment of top leaders of New York’s legislature. As our followers also know I was targeted for my testimony resulting in the loss of my livelihood, children and law practice. The ethics lawyers in the witch hunt against me resigned after falsifying their time sheets. My custody judge was removed from family court after admitting sexual misconduct on his handicapped five year old niece. No public charges came of these crimes. The list goes on. As Americans we have to act on this. For my part I continue to vote and influence politics where I can, like a convicted felon as local council president who was upset by a newcomer at the polls. I also seek accountability in our civil courts, but like Moreland, I am now being locked out. As a final resort I am writing books for corruption victims with one nearing publication. There are many ordeals that are never told and the scandals are thereby covered up. Feel free to contact me at (315) 796-4000 directly if you would like to retain my professional services.